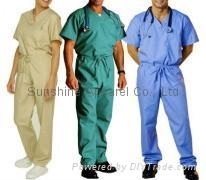 Sunshine Apparel Co., Ltd. is the most professional and experienced medical scrubs,nursing scrubs,lab coat,hospital uniform and knitting garments manufacturer in China. In order to protect the customer's copyright,there are only a little styles and printing patterns in the website. Our mission is to provide the best products and service to our customers at the lowest prices possible. We are the producer having long-term view to establish a fine reputation and credibility with every customer. We are your reliable factory in China. With over 19 years of experiences in garment line,we control the quality very strictly, from the source of material, weaving or knitting, dyeing or printed, cutting, sewing, ironing through to the packing. The company adhere to the principle of honoring contracts, maintaining credibility, achieving equality and mutual benefit. So, we have obtained our clients' trust for excellent service in best price & quality together with punctual delivery. Our products include medical scrubs,nursing scrubs,lab coat,soild scrubs, printing scrubs, nurse tunics, warmup jackets,patient wear,surgical gown, chef uniform, surgical drapes,instrument wrap,surgical cap, pyjamas , coveralls,t-shirt,polo shirt,sweater. The Qulity is good enough, and the prices are much competitive. We have been making good cooperations with a lot of wholesalers in North America and Europe.